The King Rama VII Museum on Ratchadamnoen Nok Avenue is dedicated to King Prajadhipok, the last absolute monarch in Thailand. King Rama VII (1893 – 1941) or King Prajadhipok succeeded to the throne in 1925 and reigned through a tumultuous period in Thai history till his abdication on 2 March 1935. The old building housing the museum was designed by French-Swiss architect Charles Beguelin during the reign of King Rama V and completed in the reign of King Rama VI. A fashionable Western tailor first occupied the building. The subsequent tenants were drastically different, a construction material company and later the Department of Public Works. 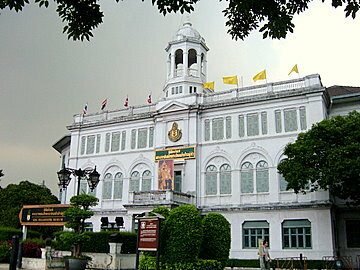 King Rama VII Museum was opened in 7 December 2002 and gives an insight into the life and times of King Prajadhipok. To start your tour, proceed upstairs and follow the directions for a chronological display of the biography of King Rama VII. Start your tour with the video clip on the genealogy of the Chakri kings. Born in 1893, the year of the French blockade of the Chao Phraya, King Rama VII succeeded to the throne in 1925 after the death of his brother King Rama VI or King Vajiravudh. Continue your tour of the museum and view the displays on the young prince's early education in Thailand. He went on to study at Eton and attended military training at the Woolwich Military Academy and later the French staff college. Displayed in the museum are personal effects of King Rama VII. These include his pencil box from London when he was a student and an account book kept by the Thai embassy in London on the young prince's study expenses. His early exposure to the West made him a firm believer in education, science, public administration and foreign languages. He saw the trend in political development and even tried to prepare for it. But he knew the kingdom was not ready. A reluctant monarch, King Rama VII needed to restore confidence in the monarchy. He realized the need for political reform as the days of absolute monarchy were numbered. With a well-intended desire for reform, he was contemplating democracy. A copy of the draft constitution prepared under his the direction is on display at the museum. But time was not on his side. There was a growing force of nationalism in the early 1920s with the new liberalism from the intellectuals and Western educated Thais. This political awakening was fired by the crisis of economic depression of 1930 that culminated in the coup on 24 July 1932. King Rama VII Museum depicts the life of King Prajadhipok, the last absolute monarch or the first constitutional monarch depending on one's point of view. It captures the life of a much-enlightened king pressured by the political events of his time and caught in the powerful forces of history over which he had no control. The museum located about 500 m from the Democracy Monument just east of the Banglampu – Ong Ang Canal, or Rob Krung, the second canal ring around the old city. Air-conditioned bus service number 79 from Pratunam (bus stop in front of the Grand Diamond Pratunam Hotel) will take you to Ratchadamnoen Avenue. Alight just before the Fort Mahakarn intersection. The museum is open from Tuesdays to Sundays from 09:00 am – 04:00 pm. Admission is 40 bahts.